Mono as a game platform? With Unity 3D you can create games and even publish it on the Wii or the iPhone/iPod Touch. First mono-based games are now in the stores. Raptor Copter Teaser (iPhone) from Flashbang Studios on Vimeo. iTunes Link. More information on Miguel de Icazas blog. 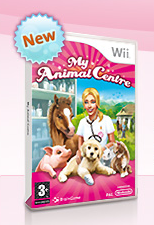 This cute Wii game (now available in germany and later in the U.S.) is based on Mono! More information and a video on Miguel de Icazas blog. Unity 3D is a game development tool, which use C# as a programming language. It allow you to publish your games on thewelches Wii or on the iPhone. Unity 3D is not free, but the price is in the professional industry not too high, but for hobbyists a bit to much. Too bad (but it seems to be a great tool :) ).